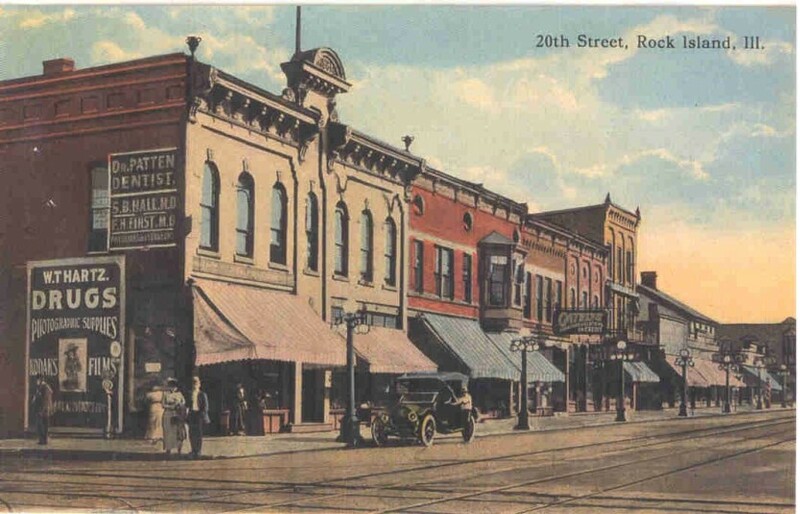 This circa 1910 postcard is identified only as “20th Street, Rock Island, Ill.” But 20th Street is long – how could we identify the photo more precisely? Since these are obviously commercial buildings, the geographical area was limited to downtown. And noting all the awnings, it was apparent that these buildings had to face either the south or the west. Although awnings are now considered decorative for all facades, in this era they were mostly functional, shading interiors from the hot sun. Even with these clues, we couldn’t identify the location. But there was one more step to take – research in early city directories for the W. T. Hartz drugstore. And there it was, on the southeast corner of Third Avenue and 20th Street. Looking at the same block today, the drugstore is gone, but the other prominent buildings on the postcard are still there and in surprisingly intact condition. The drugstore was built about 1881, the date inscribed in the central ornament above the cornice. In a book published in 1888, it was identified as the home of the Hartz & Bahnsen drugstore. It was owned by Ben C. Hartz and Frank W. Bahnsen. In 1880, the Argus reported that Ben C. Hartz, who had been a clerk for John Bengston, entered int a partnership with Fred Bahnsen in a Fourth Avenue drug store. Hartz & Bahnsen was successful and would later move to an even larger warehouse building on the northwest corner of 19th Street and Third Avenue. In a newspaper advertisement, this postcard drugstore was said to be “very commodious and attractive, elegantly and tastefully fitted up and contains a complete stock of pure fresh drugs and chemicals, proprietary medicines of standard reputation, fancy toilet articles, perfume, and druggists sundries.” The accompanying sketch indicated that paints, oils, and liquors were also sold, telling us that then, as now, drugstores sold just about everything. The drugstore used only the corner half of the building. The south storefront was used first as a hardware and stove store and later as a billiard hall. Professional offices were upstairs, accessed through the center doorway. William T. Hartz, whose relationship to Ben is not known, took over the drugstore around 1890 and remained there until his retirement in 1946. Sometime in the 1950s, this ornate building was replaced with the plain buff brick building that remains today. The building to the right of the Hartz store started its life as a grocery. Many remember it in later years as the home of A.M. Blood Office Supplies. Today it is occupied by the Restoration Place. Although the bay window is missing, the cornice and round “bullseye” windows remain. The interior has been extensively restored as well. Beyond, the “Gateley’s” sign identifies John Gateley’s Credit House, a furniture store. Although the storefront has changed for the worse, the second story and cornice look the same as on the postcard. The last of the two-story buildings on the block started life as a meat packing and produce business. In a sequence that might be considered somewhat macabre, it subsequently was used as a physician’s office and then an undertaking parlor. It, too, has small bullseye windows near the top beneath its original cornice. The only three-story building on this block has recently undergone exterior renovations to preserve and restore its original appearance. Although the cornice is still intact, the two finials on either corner are now missing. Notice the second story balcony – a feature that was removed from its northern neighbor even before the postcard was made. This balcony was functional and it even had an awning to shelter it from the sun. Many downtown buildings had similar second story balconies, but none remain today. The building was likely constructed in the 1880s for Herman Schwecke’s saloon. Mr. Schwecke had learned the business in his father’s “sample rooms” on 5th Avenue. Interestingly, the ground floor has remained a saloon to the present day. The upper two stories were designed as two large dwelling units. The remainder of the block, then and now, consists of single story structures, about two decades newer than their northern counterparts. The buildings seen today are likely the same as those shown on the postcard, although with changes in the storefronts and the cornice areas. Over the years, storefronts on this part of the block have held a clothing store, a drugstore, a milliner, a paint and wallpaper store, a bakery, a cigar store, a meat market, a hat cleaner and an Army Reserve center. And, for sixty years, one of Rock Island’s oldest continuous businesses, Leo’s Shoe Repair, has operated here. Did you notice the ornate Victorian style streetlamps that line Twentieth Street? We did too – and found it surprising that such lights are rarely apparent in “Real Photo” postcards of this era. This postcard is also missing the huge electric poles, insulators, and wires that appear in most Real Photo cards. Could the postcard makers could have painted out the ugly poles and wires and added these lovely streetlights in their place? This article by Diane Oestreich is slightly modified from the original, which appeared in the Rock Island Argus and Moline Dispatch on December 23, 2002.